Over the past 10 years, we have seen a significant increase in LNG projects and have significant experience in modelling rundown and loading / unloading systems in Trinidad, Wales, Australia, England, Egypt, Qatar (worlds first LNG mega train), Yemen, Oman, Russia, Nigeria and Indonesia. The analysis of pipe forces in a surge study of an LNG system is critical and must form a fundamental part of the study. Pipe forces and rates of pressure change are high in LNG systems due to vapour pocket formation and collapse. 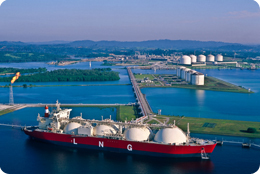 LNG is an unusual fluid in terms of the properties and effective single vapour point. The release of energy which is generated when an LNG vapour pocket returns to a liquid state is very high and occurs almost instantaneously as LNG is essentially a very pure fluid (over 95% methane). This in turn generates very high out of balance pipe loads as the high pressure waves caused by the vapour pocket collapsing are transferred through the system. We have been involved in troubleshooting a number of LNG systems which are not performing to an acceptable standard due to inadequacies in the original surge analysis study. Concerns have been raised in the past regarding the validity of the results produced from other studies and we have been asked on a number of occasions to independently review surge studies which have been carried out by our competitors, due to perceived uncertainties with the vapour handling techniques of other software packages. One of our main workstreams is providing an independent review of LNG systems for the plant owner. Our remedial recommendations have then been adopted on the systems which can include the strengthening of pipe supports and/or adjusting ESD procedures.